There are many fascinating elements to Lenka Pavlickova's work that, together, bring home the extent of her talent as well as how many individual skills are needed to successfully carve marionettes. When you consider the quality of the marionettes Lenka produces - some are so expressive they could have a life of their own - coupled with the totality of her approach - she designs, carves, clothes and paints them - you begin to understand how all-encompassing this work is. Lenka graduated from Prague Art School in 1992 after studying graphic design. She now splits her time between County Durham and Prague - where puppetry has occupied a pivotal role in the country's cultural consciousness for centuries. Puppetry is an indigenous Czech craft that has been traditionally used not only for entertainment but as a platform to express social concerns; the narrative of the puppet shows reflecting the National zeitgeist. Typically of Czech marionettes, Lenka's have no central rod and instead use strings attached to the head, shoulders and back, which makes them harder to manipulate. There are normally 15 individual parts to each marionette and these body parts are connected with screws and leather. Lenka's work is separated into two categories: unique marionettes and handmade puppets. Whilst numerous puppets are produced - each of course, by hand - the marionettes are unique - each comes with a certificate to guarantee their originality. The handmade puppets are distinctly lighter in character than the majority of the marionettes; there are jesters and fairies, a chef, an artist, even a Christmas angel. For the most part, the characters Lenka chooses to carve into marionettes are not dissimilar from the archetypes of 18th-century Prague's marionette tradition. They consist of witches, an actor - goblet in-hand, a monocle-wearing composer atop a piano, jesters, storytellers, tinkers, bell-ringers and silk-clad heroines. Aside from these well-established incarnations there are a few marionettes like 'HIV' and 'Bird Flu' that have been inspired by distinctly more modern surroundings, but nevertheless, nearly all of the one-of-a-kind marionettes are imbued with a decidedly Gothic quality. They are the characters from age-old fairy tales and mythical folklores, replete with the grotesque from centuries of establishing these archetypes. This, I believe, is what distinguishes Lenka's marionettes from her contemporaries' - of which there are few. The creases and crevices of their faces, their gestures and postures, the tiny details like fans and shells, lend them their intensely human quality. This is where the oft-debated distinction between Art and Craft becomes even more blurred. 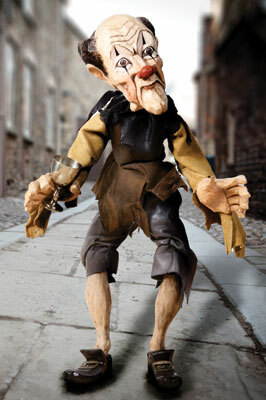 Lenka's ability is unquestioned; it takes enormous dedication, technical ability and even physical strength to create these marionettes, some of which measure up to 96cm tall. Yet it is her ability to look at the wood blanks and see a character within it that remains hidden to all other eyes, which qualifies her as an artist. 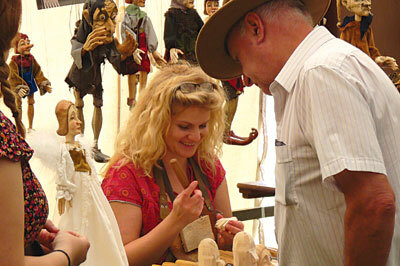 The marionettes and glove puppets are carved from traditional linden wood then preserved in bees wax before being hand painted in oil paints, which allow the character of the wood to show through. This process preserves the original quality of the wood and finishes for many generations. Then Lenka creates their costumes from natural materials such as silk, leather, velvet and cotton then individually hand finishes them. The puppets are controlled by a rocker in the traditional style which is used widely in professional theatres. I ask Lenka a few questions, trying to avoid repeating information she's been asked before or that can already be found listed on her website. 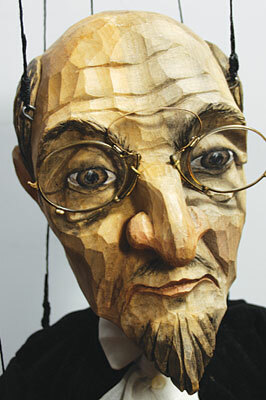 Do you take commissions to carve marionettes based on real people? A lot of my work comes from fantasy and inspiration from the world around me. I accept commissions based on other peoples' fantasies but the end result is always my interpretation of their ideas. This is an interesting way of working, but of course, more difficult. I was once asked by Microsoft to carve Mr. Ballmer, I think he was their CEO. On another occasion I was asked to carve 22 marionettes all of one man who gave them to his family and friends at his 50th birthday party! A lot of my work is used by theatres and they want whatever they need for their performance, sometimes individual marionettes, sometimes a complete group; one company has twelve. Could you describe your favourite marionettes and explain how you decide upon their individual characters? When I have an idea and I have drawn the technical drawing I send it to my father and he cuts it at our cottage in Brezina close to Jicin in the Czech Republic, but this is only the beginning because until I get the wood and start carving, I don't really have a feel for what can be done. For instance, the wood is very natural and can have different colours or there can be an imperfection that means I need to carve in a different way to my original plan, but only when it is complete and preserved can I be sure of how I will paint him or her and what clothes I need to make. Of course I love all of my marionettes, even my popular puppets that you can see on my website have something of me in them and even though they are repetitions, they are all original in their own way because I'm not a machine. My real all-time favourite is a Unique called 'Decay'. This is because he turned out exactly as I wanted him. I wanted him to have the feeling of old, rotten wood and decay. Many people have tried to buy him but he is my baby and he will stay with me always. I always say my carving reflects my mood so my husband says he is happy he didn't know me then. 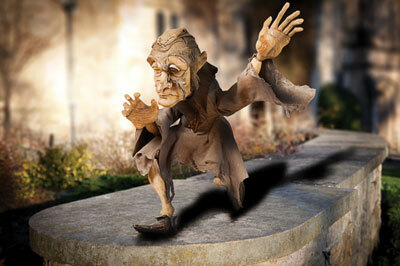 Carving the marionettes and creating bespoke costumes for them are very different disciplines. Do you approach carving differently to costume design? I don't see them as being two disciplines. For me somewhere in my mind I have an idea of what the finished marionette will look like. Because I use only natural materials I then only need to decide the style and the colours. Would you explain your carving process to us. You carve against your chest, which in a health and safety obsessed world seems like something that should carry a warning! Why do you carve in this way and what benefits does it bring to the process? I know it is usually right to carve away from your body and to use a vice. At the European Woodworking Show there were people watching me in my carving demonstration because of how I carve as much as because of what I was carving. It was interesting for me to attend shows like this as I normally do exhibitions and demonstrations of marionette and puppet making where the people are just interested in the marionettes and the puppets. This was the first time I was with other carvers and I must say, not only very talented carvers, but very friendly and welcoming ones too. There were a lot of comments about how many rules I broke. I think a few people couldn't watch, including my husband George who is more used to it now, but when I first came to England, it made him very nervous. It's interesting that you mention health and safety and a warning, because I never understood at first why George always says, "Please don't try this at home," while I am carving at demonstrations. For me it is the most natural way to carve. It means I have control over the wood and can therefore get a good feeling of what I am trying to carve. This, of course, is important for me because as I said earlier there is always a bit of me in my marionettes and perhaps because of the way I carve them, there is a little bit more then there was meant to be. How does the process behind your work differ from traditional Czech methods? The technology and materials I use are the same. Even the bees wax used to preserve the wood and the rocker that control the movement have been exactly the same for centuries. Because I sometimes paint my own silk and I choose characters that are not traditional, sometimes even controversial, for example 'HIV' or 'Bird flu', I am able to express myself as an artist. Of course I want people not only to enjoy my work and be entertained, but also I want to provoke and challenge them. As for political messages I lived my childhood under communism and I am now watching my country grow as a part of the free world and that is due to people like Vaclav Havel our first president after The Velvet Revolution. This is the reason I am free to send my work all over the world or even just be allowed to talk to you today. 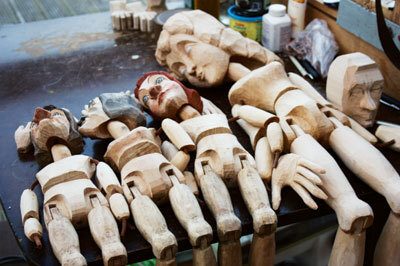 Which tools are the most important when carving the marionettes? The tools I use the most are Pfeil chisels and a fantastic saw from Japan, both of which are not easy to find in the UK. Since I moved here I have only been able to get them from Classic Hand Tools. The reason I prefer them is the shape of the wooden grip, which makes them comfortable to hold and easier to control. Also the steel is good quality, which means they stay sharper. The Japanese saw I don't know the name of but they were demonstrated at the European Woodworking Show. They are great because there are two cutting edges so it's like two saws in one and it's made from folded steel which makes it strong and flexible. What inspired you to start carving them? My grandfather use to entertain my sister and I when we were very small children. He played with puppets, he drew pictures for us and told stories. Also we have a long tradition of puppets theatres in the Czech Republic. In the past, most families would have their own puppets or small puppet theatres, before TV and computers came to make life better! Then later my mother made marionettes from clay and I started to do so as well. Then I decided I would like to carve in wood and at the time I was one of very few female carvers. With the help of my father who still prepares all of the wood back in the Czech Republic, my business and reputation grew and I have had students from as far as Japan come and learn from me. 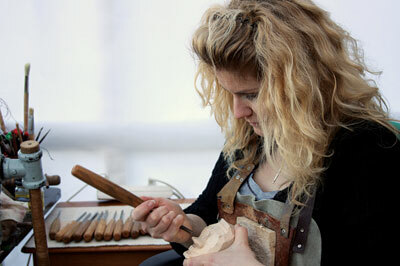 I hope in the future to be able to work with partners in Britain and America on carving classes. My life in the last 12 months has been crazy; I got married, we are going backwards and forwards to Prague and we would like to do a lot more exhibitions and demonstrations next year and expand my workshops. I will be attending and demonstrating at the European Woodworking Show in September for the second time and look forward to meeting some friends, both old and new. It is different for me to be with carvers and woodworkers rather than people who love puppets. Last year I was made to feel very welcome and I'm really looking forward to going again. I enjoyed having my work judged by other woodworkers; it's an exiting new challenge for me. 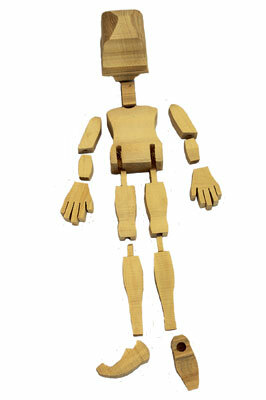 I am also hoping to find a blanks supplier so people can make their own marionettes. I have talked to some partners about weekend carving schools. Lots of people want to try to reproduce my work, but I need a partner as I don't have the ability to make the blanks at an attractive price. Next year we hope to be able to do more exhibitions, festivals and some residential weekend teaching. Also we may have something in Belgium but timing is very difficult, but if it works out it will be very exiting. Only yesterday my husband and I were in Cumbria discussing a potential collaboration with puppet theatre Upfront. We plan to run a three-day marionette carving course in the autumn. 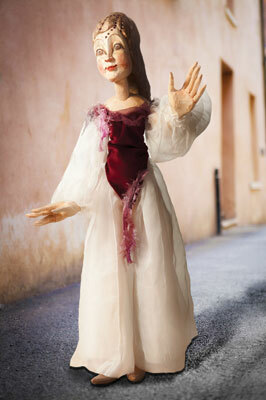 Lenka Pavlickova's marionettes are world-renowned. Her work is displayed in exhibitions, theatres and private collections all over the world. She has been interviewed by the BBC, CNN and makes an appearance on the 70th anniversary edition of Disney's Pinocchio. Even Pavarotti was a fan of the marionettes - he invited Lenka, her father and her creations to his hotel room in Prague one evening. If you are going to the European Woodworking Show this year then I highly recommend you make time to see Lenka and her wonderful work. You can see more of the work of Lenka by visiting her website. Studio images used courtesy of Ross Parker.